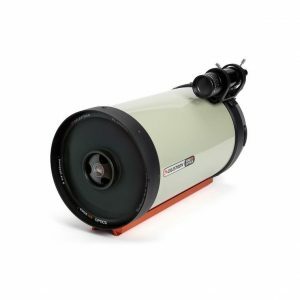 BinoCentral has the largest selection of telescopes in Perth Western Australia. 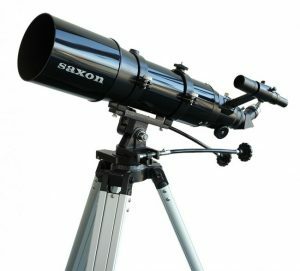 Below you will find information on the most popular types of Telescopes for sale in our store, as always you are only a phone call away from one of our experts to help you. Also remember we have our FREE viewing nights every Thursday weather permitting of course. The achromatic telescope is a refracting telescope that uses an achromatic lens to correct for chromatic aberration. When an image passes through a lens, the light is refracted at different angles for different wavelengths. This produces focal lengths that are dependent on the color of the light. So, for example, at the focal plane an image may be focused at the red end of the spectrum, but blurred at the blue end. This effect is particularly noticeable the further an object lies from the central axis of the telescope. The image of a star can appear blue on one side and orange on the other. Early refracting telescopes with non-achromatic objectives were constructed with very long focal lengths to mask the chromatic aberration. An Achromatic telescope uses an achromatic lens to correct for this. An achromatic lens is a compound lenses made with two types of glass with different dispersion. One element, a concave lens made out of Flint glass, has relatively high dispersion, while the other, a convex element made of Crown glass, has a lower dispersion. The crown lens is usually placed at the front due to the higher susceptibility of flint glass to atmospheric attack. 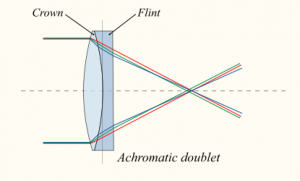 The lens elements are mounted next to each other and shaped so that the chromatic aberration of one is counterbalanced by the chromatic aberration of the other, while the positive power of the crown lens element is not quite equalled by the negative power of the flint lens element. Together they form a weak positive lens that will bring two different wavelengths of light to a common focus. “ED” means “extra-low dispersion”. When you point an achromatic refractor, like the Saxon 102mm Achromatic Refractor and of standard crown-and-flint glass, at a bright object, a purple halo, or false colour, is seen surrounding the object. If a refractor is equipped with a single lens of ED glass within its doublet or triplet objective, the false colour is barely seen if seen at all. ED doublet refractors are known as “semi-apochromats” or “super-achromats”. An apochromatic refractor uses an objective lens of extra-low dispersion glass that gives remarkably crisp images without chromatic aberration. Many consider an “apo” to be the ultimate telescope for photography and planetary observing. Said one amateur astronomer, “The sight of Saturn through a good apochromat is enough to make a grown man weep”. Many astrophotographers swear by apochromats to produce the sharpest possible images. That’s because the optical sensitivity of typical CCD chips extend from the ultraviolet through the visible spectrum and into the near infrared wavelength range, and only apochromats focus all colors simultaneously. A reflecting telescope (also called a reflector) is a telescope that uses a single or a combination of curved mirrors that reflect light and form an image. The reflecting telescope was invented in the 17th century, by Isaac Newton, as an alternative to the refracting telescope which, at that time, was a design that suffered from severe chromatic aberration. Although reflecting telescopes produce other types of optical aberrations, it is a design that allows for very large diameter objectives. Almost all of the major telescopes used in astronomy research are reflectors. Reflecting telescopes come in many design variations and may employ extra optical elements to improve image quality or place the image in a mechanically advantageous position. Since reflecting telescopes use mirrors, the design is sometimes referred to as a “catoptric” telescope. The Schmidt–Cassegrain is a catadioptric telescope that combines a Cassegrain reflector’s optical path with a Schmidt corrector plate to make a compact astronomical instrument that uses simple spherical surfaces. The Maksutov (also called a “Mak”) is a catadioptric telescope design that combines a spherical mirror with a weakly negative meniscus lens in a design that takes advantage of all the surfaces being nearly “spherically symmetrical”. The negative lens is usually full diameter and placed at the entrance pupil of the telescope (commonly called a “corrector plate” or “meniscus corrector shell”). The design corrects the problems of off-axis aberrations such as coma found in reflecting telescopes while also correcting chromatic aberration. It was patented in 1941 by Russian optician Dmitri Dmitrievich Maksutov. Maksutov based his design on the idea behind the Schmidt camera of using the spherical errors of a negative lens to correct the opposite errors in a spherical primary mirror. The design is most commonly seen in a Cassegrain variation, with an integrated secondary, that can use all-spherical elements, thereby simplifying fabrication. To help astronomers, this guide offers a simple resource for explaining what every newcomer needs to know when purchasing their new telescope. To simplify it further, we’ve split the whole process into 6 easy steps. Just follow them one by one and you can’t really go wrong. STEP 1: Do you know what you want the telescope for? Astronomical or Terrestrial (land viewing)? It seems like a basic question but you will be surprised at how many people can get this step wrong. 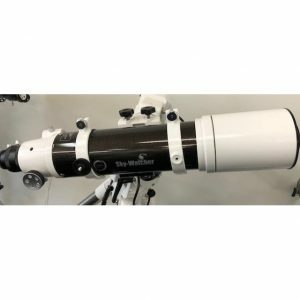 Most individuals purchasing their first telescope are keen to have their purchase provide both excellent views of both land based (terrestrial) and astronomy objects. The truth is, no matter how attractive the thought of an all round telescope is, the common rule is that land based viewing telescopes rarely excel for astronomy, with the same applying to telescopes for sky viewing. Our recommendation, particularly for beginners, is to decide which type of viewing you will be doing more of. If you are interested in doing more land viewing then you should consider a spotting scope or a pair of binoculars. You can learn more about these different options at our beginner’s guide to binoculars and Beginner’s guide to spotting scopes pages. If astronomy is what you’re looking for then continue on to step 2. 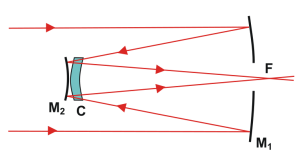 STEP 2 – Aperture is crucial for telescopes. The most important feature for any astronomical telescope is its aperture. Aperture refers to the diameter of the telescope’s main optical component (consisting of either a lens or mirror). The size of your telescope’s aperture determines how much light it can capture. The more light that is captured the more objects you can see in the night sky. Simple right? More light also means greater clarity in the images you see. Because astronomy is carried out in poor light conditions, having a large aperture means the maximum amount of light is captured for a bright and sharp image. Before you get too excited about aperture there is a small word of warning. 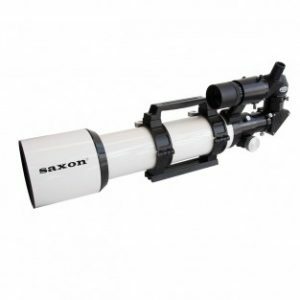 Many people are misled into believing that getting the biggest aperture is the simplest way to choosing the best telescope. What they don’t realise is that the larger the aperture the larger the telescopes and big telescopes don’t always suit everyone. Try asking yourself, “Where do I want want to use my new telescope? If the answer is nearby in the backyard then having a large telescope will be great. If you intend to carry the telescope to darker skies away from city lights, you will definitely need something of a smaller aperture but still powerful. A large scope is troublesome while travelling, while a smaller scope in a convenient location may not give as great an image as a larger scope can. So think about how large you want your telescope to be. Now this isn’t really a step, but more an important concept to understand when choosing your telescope. As said before, aperture is crucially important to your new telescope. Having said that, some will still tell you that magnification (or power as some call it) should determine what telescope to purchase. The magnification of your telescope is determined by the eyepiece you use. Changing magnification just involves swapping your existing eyepiece with one that has a higher magnification. Essentially any telescope can have an infinite range of magnification. So don’t get too excited by telescopes that promote a large magnification. It may be possible to get 800x but at that magnification you just highlight air particles between your telescope and the object you’re looking at. What would be the point of magnifying an image from a small aperture telescope that doesn’t produce a clear image in the first place. Refracting telescopes are the probably the most common telescope around. They use lenses instead of mirrors and the eyepiece is located at the bottom of the telescope. Their design is similar to binoculars and most spotting scopes. It should be noted that images from refractors are mirror images and can be corrected using an erecting prism. For beginner’s this doesn’t have a large effect on your viewing experience. – Easy to use and consistent due to the simplicity of design. – Excellent for lunar, planetary and binary stargazing especially with larger apertures. – Sealed tube protects optics and reduces image degrading air currents. – Rugged, needs little or no maintenance and its sealed tube protects optics from image degrading. – Generally have small apertures, typically 3 to 5 inches. – Smaller apertures mean poorer viewing of distant galaxies and nebulae. – Heavier, longer and bulkier than reflector and cassegrain telescopes of equal aperture. – Good-quality refractors cost more per inch of aperture than any other kind of telescope. Reflecting telescopes use a mirror, instead of a lens, and the eyepiece is located at the side of the main tube. You look through an eyepiece on the side of the tube up near the top. – Usually have larger apertures which mean excellent viewing of faint deep sky objects (remote galaxies, nebulae and star clusters). – Low in optical irregularities and deliver very bright images. – A reflector costs the least per inch of aperture compared to refractors and catadioptrics since mirrors can be produced at less cost than lenses. Catadioptric telescopes or Cassegrain Telescopes, use a combination of mirrors and lenses. 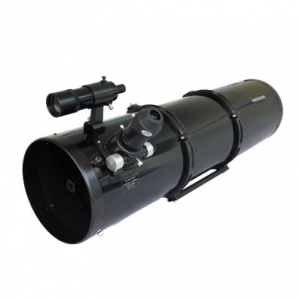 These telescopes usually have a nice modern design and have 3″ and larger apertures. Two of the popular cassegrain designs are the Schmidt-Cassegrain and Maksutov-Cassegrain. 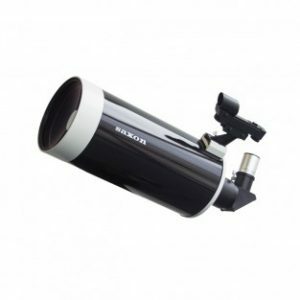 – Most versatile type of telescope with excellent lunar, planetary and deep space observing plus terrestrial viewing and photography. Now that you know what type of telescopes are out there, let us discuss an often overlooked but very important aspect – the mountings. A mount is important for stabilising your telescope and determining how easy it is to follow a star while viewing it. An Equatorial mount, simply put, allows users to follow the rotation of the sky as the Earth turns. This is a great help when you’re trying to find your way among the stars with a map. These usually cost a bit more but it is highly recommended. The Altazimuth mounts in contrast have a simpler design, meaning they just swing up, down, left and right. You have to move the scope every so often to follow the stars, moons and planets as the earth turns. An altazimuth mount is both cheaper and lighter for the same degree of stability but it misses out on the ability to easily follow the rotation of the sky when the earth turns. Well we’ve reached the last step. Making a decision on how much to spend. Our advice is to pick the telescope that meets not just your budget but also precise needs and hobbies. Sometimes spending slightly more on a telescope ensures that you get a better scope that will last you for a longer term rather than a cheaper scope that you will replace in a couple of years. Generally we recommend for customers to be prepared to spend anything from $350 through to $800 for a decent starter scope. This gives you a great starter scope that will have you enjoying clear views of the night sky and exploring the different space objects that colour the universe above us.